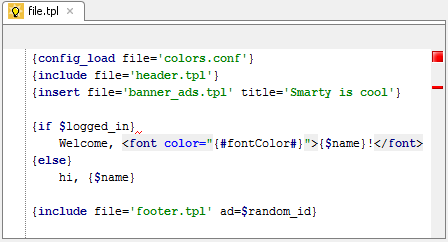 Smarty is a nice and popular template engine for separating PHP scripts from HTML layout code. Try it and let us know what you think. Vote for existing Smarty issues in Web IDE bug tracker and create your ones. Surely, this functionality is available in Web IDE PHP Developer edition only, and also in IntelliJ IDEA. This entry was posted in Cool Feature, PhpStorm and tagged PHP, PhpStorm, smarty. Bookmark the permalink.